Flipkart's annual Big Billion Days Sale will be on October 10. Flipkart cell that comes with discount and many cashback offers will run on October 14. There is still time left in the cell to begin, but before that Huawei's Sub-Brand Honor has announced the discount and buyback offer on its 6 smartphones. We are talking Honor 9N, Honor 7A, Honor 7S, Honor 9 Lite, Honor 9i and Honor 10's. Honor is also offering mobile protection with these smartphones, which start at Rs 199. 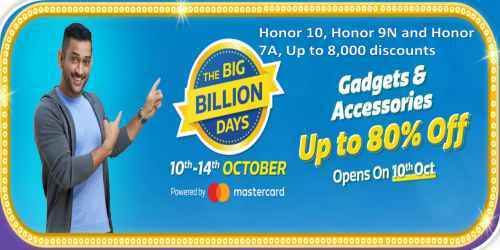 Flipkart Big Billion Days Sale: Available on Honor 10, Honor 9N and Honor 7A, Up to 8,000 discounts-Beginning on October 10, the price of Honor 9N in the Flipkart Big Billion Days cell will be reduced by 2,000 rupees. The phone's 3 GB RAM / 32GB storage will be sold for Rs 9,999. It costs Rs 11,999. The 4 GB RAM / 64 GB storage variant of Rs. 13,999 will be sold for Rs. 11,999. The price of Honor 7A has been cut by Rs. 1,000. This phone will be available for Rs 7,999. The Honor 7S for Rs 6,999 will be sold for Rs 6,499. Both variants of Honor 9 Lite will also be available with offers. This phone will have 3 GB RAM of Rs 10,999 and 32 GB storage variants will be sold for Rs 1,000. The phone's 4 GB RAM and 64 GB storage variants will be sold for Rs 14,999. But in Flipkart Big Billion Days Sale it will be available with an additional exchange discount of Rs 3,000. Flipkart Big Billion Days Sale: Available on Honor 10, Honor 9N and Honor 7A, Up to 8,000 discounts-Honor 9i of Rs. 14,999 will be sold for Rs. 12,999, i.e. the discount will be Rs. 2,000. The biggest discount for the company's flagship handset Honor 10 will be seen. This phone costs Rs 32,999. Honor 10 will be sold for Rs. 24,999 with a discount of 8,000 rupees. It is expected that in the coming days, other companies will also announce their offer of Big Billion Days Sale. Apart from this, customers can get a 10 percent discount by using HDFC Bank debit and credit card in the cell. Honor has announced on Wednesday that it has sold more than two million handsets in Flipkart in the first half of the year. The aim of the company in the festival season is to sell 10 lakh handsets on this e-commerce site.